Cleanup or process your HTML without any restrictions. Upload your Word (DOCX), PDF and other documents and instantly convert them to clean HTML. Insert images with the file manager. Supercharge your workflow by saving your cleanup options to a template. Export your HTML to Word or PDF. Create email signatures and with logos. Get extra options in the Visual Editor like more fonts and a spellchecker. Resize the windows to suit your needs. Save and open your files from any browser. Save time. Upload and convert Word, PDF and other files to HTML. Even OCR text from PDF files. Work smarter. Store your files, templates and settings online. Work from any browser. Work faster. Multiple find and replace with regular expressions - more control over cleanup. Working on a HTML email? You can send a test email to see how it will look. You can edit the delivery address below and add a subject line. Word To HTML is excellent for creating or converting single files, but for bulk converting documents you need our sister product Doc Converter Pro. You can batch convert as many files as you like and because you are converting locally, it is dramatically faster. Also because the data never leaves your system it is a more secure option for confidential documents. You can convert Word to HTML, Word to PDF, PDF to HTML and more. Create custom conversion templates to suit your needs. You have full control over images, CSS, find and replace/delete and more. You can even share your templates with colleagues. 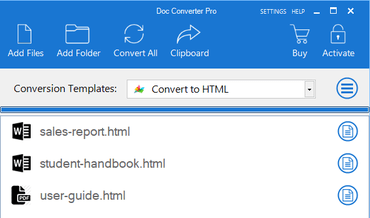 Word To HTML is excellent for creating or converting single files, but for bulk converting documents you need our sister product Doc Converter Pro webapp. Everything is web-based, so you have the ease and convenience of being able to convert from any browser. Being web-based also makes it the perfect choice for teams. 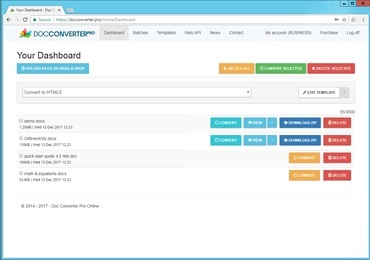 Developers can use our Web Rest API to integrate our conversion power into your own application.